Electric Imp’s Getting Started Guide will familiarize you with the Electric Imp Platform, its key concepts, its development environment, and BlinkUp™, Electric Imp’s patented device set-up technology, which you use to configure your imp-enabled development devices and which your end-users will use to get your connected products online. 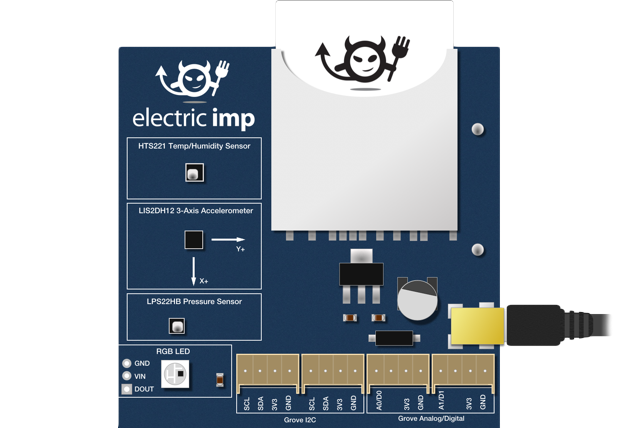 The Guide is based on Electric Imp’s impExplorer™ Developer Kit, which incorporates an array of sensors and other components, and easy expansion. For full details of the on-board hardware, please see this page. It was designed as the basis for simple, self-contained projects, and for evaluating the Electric Imp Platform. If you require full access to GPIO and peripheral buses, you should choose one of our standard breakout boards. In addition to this Guide, we also have a handy printable two-page Cheat Sheet detailing all of the key features of the Squirrel programming language used by the Electric Imp Platform. The set-up process described in this Guide applies to all Electric Imp development systems, but we also have specific versions of the Guide which focus on other products, and a generic set-up guide.